​If you are having trouble with the garage door opening and closing, it may be due to a problem with the springs. When the springs are properly adjusted, the door is balanced and can be opened easily with the garage door opener or manually. It is recommended that you check the balance of the garage door at least once per year, especially if it is typically operated with an opener. There are no tools required to test the balance, but if it isn’t balanced correctly, trying to repair it on your own may result in severe injuries, so you should call a professional to do the repairs. There are many different parts that work together to make your garage door operate correctly, but the springs play an extremely important role, primarily in the balance of the door. The goal of the springs is to counteract the door’s force of gravity, which means the door spring is meant to make the door light enough for you to lift on your own and/or for the power from the opener to lift it up easily. There are two primary types of residential garage door springs — torsion springs and extension springs. Torsion springs are typically mounted directly above the garage door. In older homes that have less room in the garage, they might be mounted towards the rear of the garage. Torsion springs, when installed and operating correctly, are responsible for balancing the door. Being balanced in this case basically means that the door should use the same amount of pressure to open and close and be easy to manually lift. Torsion springs are designed to last a long time, but over time they weaken and can break. Extension springs, in most situations, are mounted above the garage door track. However, in others, they may be mounted vertically on the sides of the track. Extension springs use the pulling force of the spring to pull the door upward, against gravity. Is the Spring Balanced Properly? A well-functioning garage door is one that opens and closes quietly and smoothly. If it stops working, try to operate the door manually by pulling the cord attached to the arm of the connecting rail trolley system. If it is still difficult to operate, disconnect the operating system and open the garage door halfway by hand then let go of the door. There may be slight movement, but if it is balanced, the door will stay in pretty much the same position. If the door opens on its own or wants to drop on its own, the garage door springs need to be adjusted. The springs, along with the help of other components, including the drum, cables, track, rollers and hinges, are responsible for the smooth operation of the door. However, the springs are responsible for maintaining the balance of the garage door. If the door appears to be unbalanced, it is important to repair or replace the springs as soon as possible to prevent further damage to other components as well as to avoid the risk of injury. It is important to understand that replacing or repairing the torsion or extension springs is not a DIY repair. 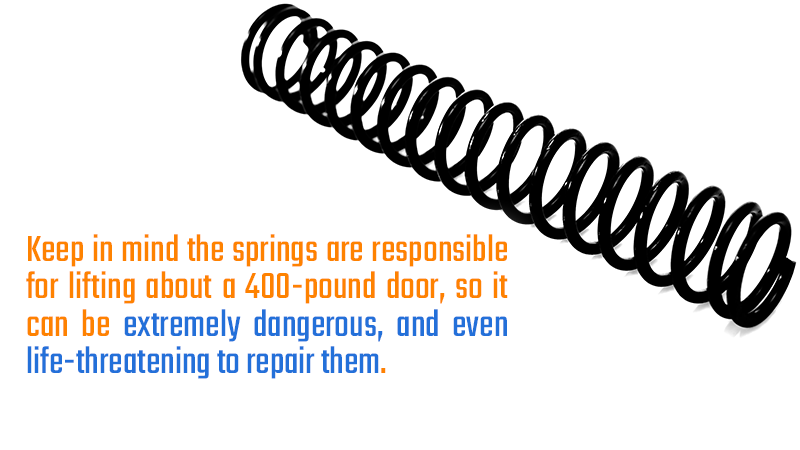 Keep in mind the springs are responsible for lifting about a 400-pound door, so it can be extremely dangerous, and even life-threatening to repair them. Subscribe to our blog for regular tips and updates. Subscribe! Do not risk getting injured, if your garage door is unbalanced and the springs need to be replaced, contact ACS Overhead Doors to schedule an appointment.